Pre-Sale: Item will not ship immediately. Please call if you are working with a short time-frame. With the growing popularity of HD video production, the Datavideo SE-1000 Switcher Package is an interesting and viable choice for small production companies, churches, OB vans and corporate production departments. It supports live production using, 5 inputs (HDSDI or SDI) plus one computer and one still frame. And, it has three outputs (HDSDI or SDI). Since all internal processing is done in HD, you’ll get the most from every input. Included is a Linear key and self key effect for easy titling or logo insertion, and can be used with an external Character Generator. The SE-1000 has Composite SD (and composite YUV) monitor outputs for each input. 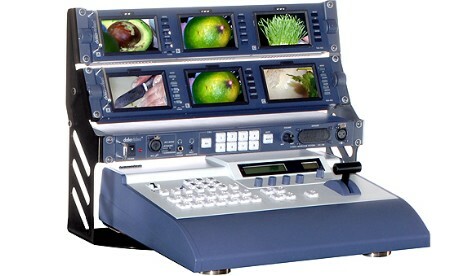 The SE-1000 package includes two 19” racks of 3 monitors each, and a holder that has an extra 1ru space for an intercom. It also comes with a tally box with six LED tally lights. One benefit of the package is that the monitors are included. No genlock is required because there are built in frame synchronizers. For those who wish, this switcher may be slaved to an external reference. The SE-1000 is a compact, portable switcher that does all processing in HD, accepts either HD or SD and is supported by a family of collateral products including monitors, distribution amplifiers, tally lights and intercoms. In addition, we have a range of shipping cases and mobile studios customized just for the SE-1000. All equipment operates on 12Vdc for use in a van. SMPTE color bars as 7th source.